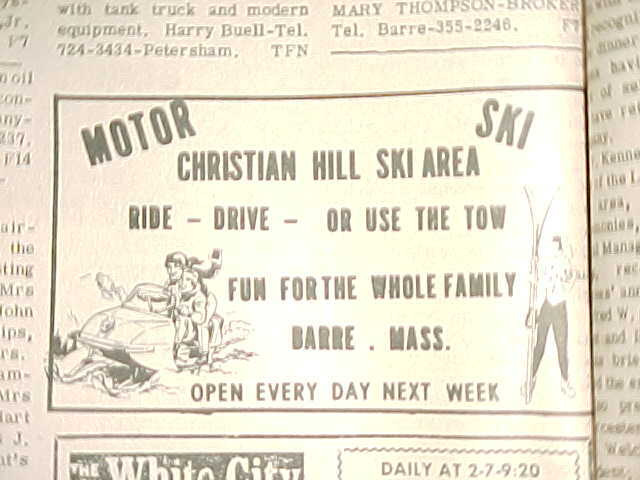 Over the winter, I found out about the Christian Hill Ski Area that was located in Barre, MA. This is an entirely different area than the Pine Ridge Ski Area which was also operating at the time and still is in operation. The Christian Hill Ski Area can be located by following School Street, which turns into Williamsville Rd (A.K.A. Christian Hill) for about a mile from the center of town toward Templeton. After the former Charles G. Allen Corporation (a large red machine shop on the left at the bottom of School St.) you will begin to climb what was once known as Christian Hill. The area was almost to the top of the hill on the left behind the houses. Ironically, I grew up on School St. and never knew that the area existed there. I recently purchased that house. In the winter, there is a clear view of the hill where the area once was from both my kitchen and bedroom windows. It is mostly grown in now. 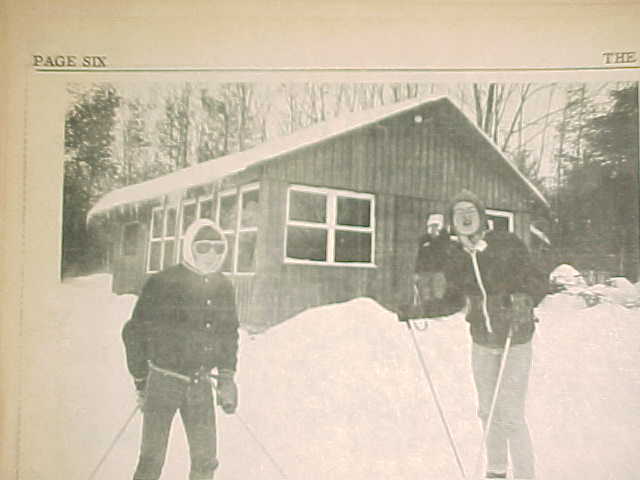 Ad from a February 1968 issue of the Barre Gazette for the upcoming school vacation week. The area was owned and operated by Dorothy Bassett and her sons ( Paul, Joe and Dennis). When I found out the name of the owners it was even more of a surprise since I actually knew them. I decided to contact Dennis Bassett for information on the area. He told me that the area opened in the early 60's and ran for a little longer than 5 years. The area was built by members of the family, with his brother Joe doing most of the clearing of the hill. They used old car wheels and poles to run the rope up the hill. They had a rope tow that was approximately 600 feet long and had a vertical drop of about 150 feet. He told me that the family had several snowmobiles that they would use to pack the slope. They also rented these snowmobiles from the barn also located on the property. They had a lodge at the top, which actually made this an up-side down area as the parking was also at the top. Dennis said that the lodge was enlarged and later became his first house when he got married. He suggested that I also speak to his brother Joe, as he was rather young when they had the area. 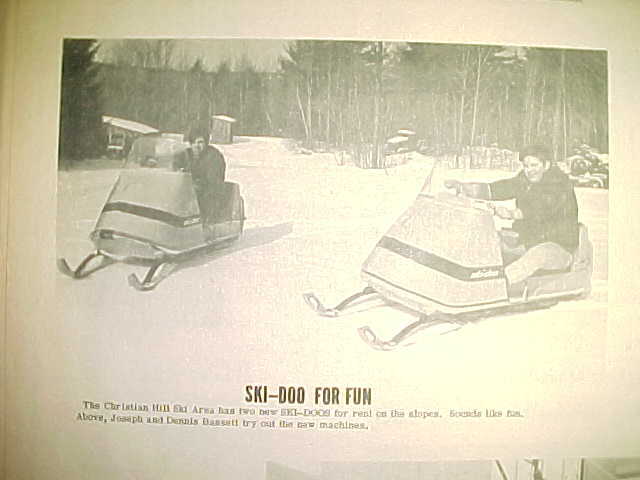 The Christian Hill Ski Area has two new SKI-DOOS for rent on the slopes. Sounds like fun. Above, Joseph and Dennis Bassett try out the new machines. The lift was powered by a 1953 Ford Pick-up, which is still on the property. The area had a ski patrol affiliated with the National Ski Patrol (NSP Home Page), his mother was a member and he was a junior member. They also had ski lessons. Joe was the primary instructor. The small lodge had a free standing fireplace for skiers to warm themselves around. They also served refreshments. Joe remembers a coke cooler and a grill being in the lodge. He also told me that there was a pair of skis mounted in an "x" on the wall. These skis belonged to a friend, Eddie Cormier who broke them going over a jump. They were brand new when he broke them. "We were all jumping, Eddie, Paul and I. Joe was having some trouble with the jump so Paul and I told him to lean forward. He leaned too far forward and broke the tip off of his skis. My mother (Dorothy), mounted the skis on the wall of the lodge and they stayed there for many years. Eddie went to Vietnam shortly after this, he was killed in Vietnam. My mother really liked Eddie, so even after the ski area closed the skis remained on the wall. When they were finally removed from the lodge, my mother took them to her house." Two skiers outside the lodge at Christian Hill Ski Area. The owner of the area, Dorothy Bassett, passed away in 1999. The skis are still in her house. Several parts of the old ski area can still be found on the property, though most are either in the barn or near the barn.